DB9 - The World's Most Timeless Sports GT. New design. Timeless as ever. It was an incredible challenge, make a great design even better. It took an extraordinary collaborative effort to achieve. Nearly 50% of all parts and more than 70% of all body panels are new, but it is as timeless and elegant as ever. The best DB9 yet. Peak power of 510 BHP. Effortless torque of up to 620 NM. A sprint time of just 4.6 seconds. Our new AM11 V12 engine ensures this is the most powerful DB9 ever produced. To us power isnt everything; a CO2 reduction, saving 12g/km not only means this is the most potent DB9, its also the most advanced. Success in the highly competitive World Endurance Championship with the DB9 and a return in 2014 to Daytona for the 52nd running of the 24 hour race reaffirm Aston Martins commitment to taking on the toughest competition. New components and more advanced engineering also make this the most rigid DB9. Our state-of-the-art VH architecture has been made even better. The figures speak for themselves; a 20% increase in stiffness in DB9 Coupe, a huge 30% increase in DB9 Volante, we went further, our engineers made more of less the new DB9 is 33lbs lighter. The best DB9 braking system weve made sees advanced carbon ceramic brakes fitted on every car. Giving a better response with a longer life and bringing improved performance with virtually no fade. The New DB9 feels great whatever the speed, whatever the environment. We didnt settle for a standard interior. We reached new heights in material artistry. Master designers worked with expert craftsmen and produced a level of fit and finish unheard of in a Grand Tourer. Take the flowing leather welts - custom made by hand in new facilities, the control switches made of real glass, the leather the finest Bridge of Weir hides. The result? The most luxurious Aston Martin DB9 in history. 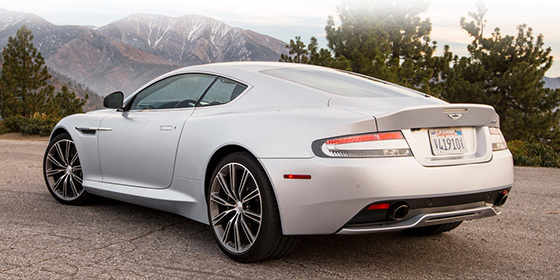 Creating a new, better DB9 was a challenge our designers knew was going to be hard. How to improve on one of the most iconic models in automotive history? We started with a core principle, a principle that ran throughout the early stages of sketches and modelling, the same principle which now defines the New DB9 timeless elegance. We took a design we loved, the DB9, a design admired since 2003. With nine years of development in our cutting edge VH architecture we knew we could take this design and create a better, even more beautiful DB9. We created a design with echoes of the classic 'DB' model line but with contemporary elegance and a purity of form. Our designers pushed to produce a car that was as close to the sketches as possible and the engineers delivered. 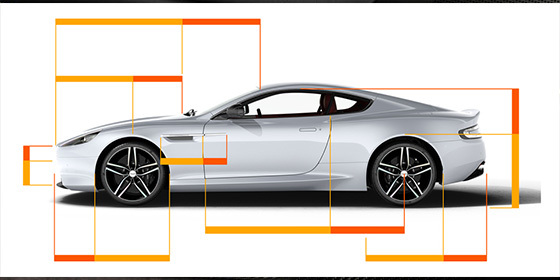 Over 70% of all body panels are new - our designers designed the most elegant DB9 ever, our engineers created it. Every inch of DB9's form is designed for elegance and balance. The simple beauty of nature guides the design of DB9, with the 'golden ratio' setting all proportions. The result is a profile where every line, dimension and proportion works in harmony. Combine this with the near perfect weight distribution, provided by a lower engine placement, and you have a DB9 balanced on sight and in experience. An elegant design wasn't enough, it had to work with engineering to deliver performance. The New DB9 combines exquisite exterior lines with advanced engineering to make this the most aerodynamic DB9 we've ever produced. A pronounced rear boot 'flip' and a new bonnet structure mean dynamic airflow is smoother than ever.